9th July was the birth anniversary of Vasanth Kumar Shivshankar Padukone, more famously known as Guru Dutt. It is only recently that I noticed that I had not reviewed a single film of his on this blog, though songs from his films have made repeated appearances in one post or another. In order to make amends, I decided to review one of his films as a birthday tribute, belated though it is; not the ones that are the most talked about - Pyaasa and Kagaz ke Phool - but one of his 'lesser' movies, the first film produced by his newly formed production house, and his fourth directorial venture. 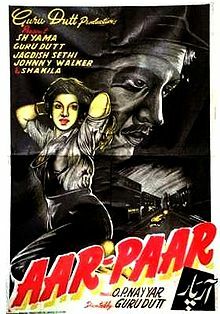 Aar Paar was a very important film for Guru Dutt - his earlier film Baaz had not only been panned heavily by the critics, it had failed to set the box office ringing; it was very necessary that this film succeed. In a burst of optimism, or foolhardiness, Dutt decided to set up his own production house to produce the kind of films he wanted to make. Friends Nabendra Ghosh, Raj Khosla and VK Murthy came on board, Geeta Bali, who had acted in all three of his previous ventures - Baazi, Jaal and Baaz - was signed on as heroine. OP Nayyar, who worked with him earlier on Baaz came on board for the music, with Majrooh Sultanpuri as the lyricist, and the film was scheduled to roll - when Geeta Bali bowed out and Shyama stepped in. Kalu Birju (Guru Dutt) is a taxi driver who is in jail for rash driving. When the film begins, he’s being released two months before the end of the term for his exemplary behaviour. (He assumes he's being taken to task for smoking.) As he takes leave of the other inmates, one of them asks him to go to a particular club where he’ll find a man named ‘Captain’. He’s to deliver a coded message to this man. However, Kalu’s first stop is his employer’s (Rashid Khan) garage – he wants to start plying a taxi again. The employer refuses – the taxi needed extensive repairs, the insurance company still hasn’t paid the claim, and now Kalu wants him to hand a taxi over to a jailbird? Kalu goes away angry, and not really looking where he’s going, trips over a mechanic working under a car by the side of the road. Still angry with his employer, he pulls the mechanic out by his feet. Their acrimonious exchange establishes his arrogance (Mard ke bacche hain, sar uthake chalne ki aadat hain! ), one which she is no mood to tolerate. He continues to irritate her by offering to call the police for her, but before she can retaliate, she is interrupted. When she leaves (taking his coat with her), Kalu makes his way home, where his sister (Ameer Banu) welcomes him warmly. But not so his brother-in-law, who is upset that a criminal is sheltering in his home. Does his wife want their son to grow up and become a crook as well? Kalu, who overhears their conversation, quietly leaves the house. Wandering about the streets, he runs into Elaichi (Jagdeep) who offers him a beedi, a place to stay, and some hard-won street wisdom. Kalu is amused and intrigued by the child, who seems much older than his years. Night passes, and the next morning brings Kalu a rare stroke of good fortune – he finds the car, which the girl he had met the day before had been driving, parked outside a garage. Going in to recover his coat he manages to talk his way into a job. And a place to stay. He also discovers that the girl’s name is Nikki (Shyama), and that the garage is owned by her father Lalaji (Jagdish Sethi). Once he’s got his employment fixed, he decides to complete the errand that his jail-mate had entrusted him with – to find the elusive ‘Captain’ and pass on the message. At the hotel, he first runs into the club dancer (Shakila). [Since she doesn't have a name in the film, I'm going to continue to use 'Shakila' to denote her character.] She first notices him because he is new there, and when he later rescues her from a patron who refuses to take no for an answer, she is intrigued. That becomes more marked when he says he’s come with a message for ‘Captain’ from 114. When told that Captain is not there at the hotel, he leaves with a laconic wave. He returns to the garage, and the next morning, is surprised to see the club dancer there – she needs a mechanic. She and Rustom (Johnny Walker) were fleeing from the police when their car develops a fault. Shakila is equally surprised to see him there. A suddenly-irritated Nikki flounces off, but is interested enough to watch them from afar. Boorish and arrogant though Kalu is, it appears that Nikki is not as disinterested as she appears. And amidst the spanners and spare tyres, she loses her heart to Kalu. Though she is not going to admit it, not she. Especially not when Kalu seems to be taking it for granted that she will soon fall in love with him! Unfortunately for them, Nikki’s father walks in just then, and justifiably angry at what he sees, throws Kalu out. Once again, Kalu is jobless. As he plans his future move with Elaichi, which is to own a taxi of his own, things are coming to a boil elsewhere. The police are in search of the car that Shakila brought in to repair. When Lalaji informs them that he wasn’t there when the car was brought in, but the man and woman who brought it in were known to his mechanic whom he had dismissed the previous day, the inspector is caustic – that was very convenient. Perhaps he should be careful whom he associates with… As he leaves, the Kazi (Rajinder), a friend of Lalaji walks in, and is alarmed at seeing the police there. It is in conversation with Lalaji that he remembers where he had seen Kalu before – the man had been in jail! Nikki, who overhears their conversation, is shocked. Meanwhile, the man known only as 'Captain' is furious! Why did they have to use his car? Now the police have their eye on it, and the police are going to suspect whoever uses the car. It is at this time that Kalu comes to meet Captain to pass on 114’s message. He’s warmly (and loquaciously) welcomed by Rustom, who takes him down some winding passages and secret doors to Captain, a man who is shrouded in shadows. He claims that he’s not 'Captain'; nor is he the sort of man who knows jailbirds; fine, you don’t have to listen to the message, retorts Kalu. Captain tells Rustom to get Kalu a new taxi. On one condition – Kalu should be available to take them wherever they want to go, whenever they call for him. Kalu agrees. Now he has a brand-new taxi and a cleaner (Elaichi) to go with it, as well. His first stop is at Nikki’s garage. After making sure that her father is not in, he gets Elaichi to call her outside. Her initial reaction irks him. So he drags her off to the jailor so the latter can give him a character certificate. The poor jailor meanwhile, is getting pulled up by his superior officer for being sympathetic to the prisoners. Despite his superior’s irritable presence, the jailor gives Kalu a sterling recommendation. This of course means that Nikki has to beg Kalu’s forgiveness for having doubted his character! The next scene cuts to three men being dropped off near a bank in three different taxis, while Rustom ensconces the Captain in a bar that overlooks the building and joins them. They synchronise their watches, and then, after a few moments hurry into Kalu’s taxi and drive away. They meet later in their hideout, and it turns out that this was just a trial run for a proposed robbery. Meanwhile, Kalu having cleared his ‘character’, decides to ask Nikki's father for her hand in marriage. The Lalaji turns purple at the suggestion – his daughter to marry a jailbird? And tomorrow, when he’s jailed again for fraud, where is the poor girl to go? So it is ‘begone and do not let me see your face again’ and Kalu goes away, furious, while Nikki is left to sob in silence in her room. As he turns the corner in his taxi, however, Nikki stops him. Kalu gives Nikki an ultimatum – she has to choose; it’s either him or her father. When she asks him for some time to think (what will people say if she runs away with him? ), Kalu arrogantly tells her it’s not that difficult to make a choice. He flippantly tosses a coin in the air and asks Nikki – Aar ya paar? Bolo! Poor Nikki, though aghast at the thought that their love seems to be a gamble for Kalu, agrees to elope. Kalu is still rather obnoxious – he tells her he will come by the house at 11 p.m. If she comes out, fine. If she doesn’t, that is the end of their love story. He leaves and Nikki goes back home to while away the hours in deep anxiety. At the appointed time, her deep love for her father and the respect he holds in the community, stay her feet; it is only when Kalu, hurt and angry at what he sees as her betrayal, drives away that the sound of the car shocks her out of her reverie. By the time she unlatches the garage doors, it is to see the headlights of his car flash by her. Kalu goes back to Captain’s den, where he finds Shakila, who is more than half in love with him, slightly drunk. The next morning, he confides in her about the failure of her plan. (Shakila is the one who persuades him to elope with Nikki if her father doesn’t agree to their marriage.) While Shakila flirts with him, Rustom comes along to hand out some homespun wisdom on women. He brushes them off with a cynicism borne out of his broken heart. That cynicism spills over when he hears a pair of lovers plight their undying love to each other in the backseat of his taxi. Meanwhile, Elaichi tries to sort out the quarrel between Kalu and Nikki. The poor girl, left desolate by Kalu not coming to see her any more, gives in to Elaichi's pleadings and goes with him to the club to coax Kalu away from the the path he's taking. However, things don't go exactly to Elaichi's plan; Kalu's fragile ego cannot take what he sees as Nikki's rejection of him - he insults her and sends her away. Kalu is slowly beginning to realise that Captain's businesses aren't exactly legal. Caught by the Captain while trying to discover what's in the boxes that he had helped pick up one day, Kalu tells him that he's quitting. But no one can really 'quit' a life of crime, and Captain is not about to let Kalu go so easily - he'd hired Kalu for a specific 'job' and Kalu has to complete it. Kalu is captured, but the Captain is still wary. Now that Kalu knows the truth, he is a danger to them. There's only one way out; they cannot ruin months of planning because of one man. Kalu has to die. He hands the chore over to Rustom. Shakila, meanwhile, is sympathetic to Kalu's plight. He's in danger, she warns him. Will she free him? asks Kalu. Shakila doesn't have to say any more. Aar Paar is a noir film that is infused with humour. It was deftly directed, and a formulaic plot was generally forgotten while you were watching the film. Dutt's friend and collaborator, VK Murthy, was behind the camera as usual, and the Dutt-Murthy combination's play with light and shade was nothing short of magical. And nowhere is it more evident than in Hoon abhi main jawan ae dil where Shakila, as the vamp, tries to convince the bar regulars, and perhaps herself as well, that she is still young, still desirable. Guru Dutt maintains a hectic pace throughout the film, even the romance between his Kalu and Nikki going ahead at breakneck speed. He frames his scenes well, particularly the one where Nikki, torn between her loving father and arrogant boy friend, comes a tad bit too late to the door where Kalu is waiting for her to elope - her distraught face is lit by the headlights of Kalu's car as he speeds away from her life. The film, originally meant to wind down to an emotional climax, according to Abrar Alvi, was shot and canned. And then Dutt had a change of heart - he shot an alternate climax with a car chase, gun fights, the works. While Alvi had to hold his peace about the change, the climax is the weakest part of the film. Nabendu Ghosh's screenplay is brought to life by Alvi's sparkling dialogues - Aar Paar was Abrar Alvi's first full collaboration with Guru Dutt, one that would endure until the latter's sudden death, ten years later. Like Raj Kapoor, Guru Dutt fleshed out even the minor characters in his films, and here, thanks to Alvi's innovative use of regional dialects, they all got their own unique voice. While Rustom speaks Hindi the way a Parsi does, Lalaji speaks a rough Punjabi dialect, while Kalu's Hindi has the flavour of Madhya Pradesh, the place he hails from, and his English is quaintly formal but not very correct. (Thank you very much, kindly.). Elaichi speaks Bambaiyya while Captain and Shakila speak plain Hindi. Suddenly, the dialogues seem to showcase the melting pot that was Bombay. The city, in fact, is as much a character in the film as the human leads. It is framed, lovingly, both dark and well-lit, and melts so much into the background as every scene, including the songs, play out against its backdrop. While Kabhi aar kabhi paar is staged against a construction scene, Mohabbat karlo jee bhar lo plays out in the cab as it traverses the length and breadth of the city. Sun sun sun sun zalima is brilliantly choreographed in the closed confines of a real garage, and Arre na na na na na na tauba tauba was picturised in Victoria Gardens, while both Babuji dheere chalne and Hoon abhi main jawan highlight the smokey atmosphere in the bar. This was OP Nayyar's first big hit (he had earlier worked with Dutt in Baaz but the songs had not made much of an impact), and he made the most of it with eight scintillating tracks. Their picturisation also stands testimony to Guru Dutt's ability to use songs to aid his narrative. According to Shamshad Begum, Kabhi aar kabhi paar was her first recorded song for Nayyar. (Trivia: the song also heralded Kumkum's first screen appearance and was her first song.) Arre na na na na na na tauba tauba introduced Johnny Walker to his future wife, Noor, Shakila's younger sister and Johnny Walker's romantic interest in the film. Guru Dutt, never a great actor at the best of times, still manages to infuse his Kalu with an innocence behind his arrogant façade. Kalu is a mass of contradictions - he claims not to want much, but it is obvious that he is willing to overcome his scruples for a chance at luxury. It is clear that he loves Nikki, but he needs her to be subservient to him. Shyama is beautiful, and a wonderful actress, but her Nikki is woefully under-written. Shown as a smart, spunky, 'modern' girl, who works in her father's garage, and is perfectly capable of repairing cars, she suddenly turns into the archetypal Hindi film heroine, clad in salwar-kameezes, and engaged in making tea, and stitching, taking care of her father when he is ill, and looking woebegone when she is jilted. I do not know whether it was Guru Dutt's famed sexism at work, but very few of his heroines were given the depth of character that the other characters in his films were. A case in point is Shakila, ostensibly the vamp, who is definitely more multi-dimensional (and absolutely gorgeous!) than the heroine - she drinks, she dances in a club, she is relatively open about her role in seducing men to lose their wealth at the tables of chance. And no, she is not the quintessential 'whore with a golden heart' who, for love of the hero, will sacrifice her life to save his. On the contrary, she is the one who influences Captain to kidnap Nikki, and while she has a little bit of sympathy for him at first, she doesn't buckle under - she thinks of a plan to remove her rival and keep Kalu near her forever. She doesn't even repent! a first, perhaps, for a 'heroine' playing the secondary role. This must be the first film where I have nothing to say about Johnny Walker. As Rustom, the Captain's sidekick and the barkeep, he really had nothing to do. Except romance Noor, and that song, lovely though it is, is the one song that really seemed squeezed into the film, because it was Johnny Walker and therefore, he had to have a song picturised on him. Yet, despite all its flaws, Aar Paar is definitely worth watching again, if only to see the growth of a good director into a great one. Hey Anu, I watched Aar Paar three years back and I like your choice of film. Guru Dutt and melancholy is so cliched and I wrote a post today on this. Do take a look when time permits. Aar Paar was the beginning of his brand of humour which found concrete shape in Mr and Mrs 55, two years later! Also interesting is the story behind OP Nayyar composing the music for this film. Apparently, Guru Dutt had borrowed money from Nayyar and as Nayyar was planning to pack his bags and leave Bombay, he went to Dutt to get his money back. Dutt wasn't having any cash to pay and instead gave him a chance to compose the music of Aar Paar. Need to verify this anecdote. I was not in the mood for either Pyaasa or Kagaz ke Phool or even Sahib Bibi aur Ghulam; that's why I chose this. Everyone talks about Mr and Mrs 55, but seldom is Aar Paar mentioned. Will take a look at your blog when I return home in the evening. As far as I know, he was introduced to Guru Dutt by Geeta Dutt, and was offered Baaz. Then, he was signed for Aar Paar, but he apparently had to chase Guru Dutt to get his payment. He finally got it and then Dutt offered him Mr and Mrs 55, which he didn't want to do because he was tired of working with Guru Dutt. Dutt promised him double the amount that he was paid for Aar Paar if he signed on. Again, this is something I read somewhere; someone was quoting an interview of OP Nayyar, so I have no way of knowing its veracity. I liked your review of the movie very much, you raise points that puzzle a viewer sometimes, one lets go because it is hindi cinema, but then wonders about it because it is a Guru Dutt film and expects better. Specifically Shyama turning from spunky to salwar kasmeez clad typical girl. I. Saw aar paar years ago when we used to rent videos and saw a few of Guru Dutt movies in a row. I saw Pyasa and kagaz ke phool before watching aar paar. After Kagaz ke phool, I did not want to watch anymore Guru Dutt. Then saw sun sun sun in a video of songs and liked Shyama's character which led to watching both aar paar and Mr. & Mrs. 55. Both were very enjoyable and in both, there is something of a put down portrayal of women. He also features KumKum in his movies though in very minor roles. I don't know what was it about Shyama calling her father lalaji that it is etched in my memory. It was very endearing. Nice review, Anu. I last watched Aar Paar in the early 2000's and liked it. Especially remember liking Shakila much more than Shyama (whom I like otherwise). Maybe because Shakila's character here was more multi-dimensional and because she gets to sing one of my fave Geeta Dutt songs - Hoon Abhi main jawan. But then, all the Geeta Dutt numbers in this movie are lovely. I had heard the anecdote quoted by Arjun Narayanan below from an uncle - about OPN planning to leave Bombay and Dutt offering him the movie. Not sure about its veracity. My most serious problem with Guru Dutt's films is his treatment of women. :( Yet, there is a vision, an auteur-ship, if you will, that makes his work very fascinating. Here, as you point out, it is not the salwar-kameez that is the issue; it is that the spunky Nikki of the earlier part of the film turns into this lachrymose woe-is-me female. Thanks, Harini. I'm glad you enjoyed it. As I told Arjun, I've heard another version of the same anecdote, and I don't quite know if my version is true, either. About Johnny Walker - it's not that I didn't like him as Rustom; I did. He always bring a smile to my face. My issue is that he didn't bring anything to the film. Take away Rustom, and you didn't miss anything. And that's a shame. Hmm, I was saving this for a day when I really needed a "new" Guru-Dutt film ... but you make me want to discard that plan, ASAP. I hope that is a good thing. :) Let me know how you liked it when you finally watch it. Oh yes I have read the version you mentioned in some magazine / interview - that was the one I knew. But again, it may not be true either! "My most serious problem with Guru Dutt's films is his treatment of women." Great review. One wishes that later in his career Guru Dutt interspersed his serious movies with light-hearted ones like Aar Paar and Mr and Mrs 55. It can be said that Guru Dutt played one of the first 'taporis' in Hindi cinema in Aar Paar. Incidentally, you have mentioned that the song which "plays out in the cab as it traverses the length and breadth of the city" is Mohabbat karlo jee bharlo. Actually, it is Yeh lo main haari piya. Thank you, Sarita. I too wish he had alternated between lighter movies like these. Who knows? Perhaps his depression may not have advanced so much if he had. Yeh lo main haari piya as well, but I liked that Mohabbat karlo jee bharlo also shows us the city as a character in the film.